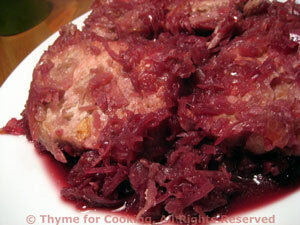 Pork Chops with Red Cabbage, Thyme for Cooking healthy gourmet. With the cabbage already made, this becomes an easy midweek dinner. Heat oil in medium nonstick skillet over medium heat. Add onion and sauté until tender, about 5 minutes. Add pork chops, pushing onion off to the sides of the pan, and brown on both sides - about 5 minutes per side. Add beef stock and scrape up any browned bits on the bottom of the pan. Add cabbage, stir to combine with onions, reduce heat to low, cover and simmer 20 minutes, until pork chops are tender and done, stirring cabbage once or twice. Serve. This is a wonderful, colorful side dish for fall and winter. 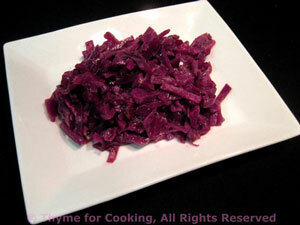 Red cabbage is the perfect, and traditional, accompaniment to game, roast goose and duck. I also think it goes beautifully with pork. This will make enough for 2 or 3 meals (maybe more, depending on the size of the head). It freezes well if you have more than you want for this week. Just thaw and reheat! Slice the bacon into thin strips. Sauté bacon over medium-high heat in a large saucepan, Dutch oven or soup pot, big enough to easily hold the all of the cabbage. Chop the onion and add to the bacon. Shred the cabbage by cutting a slice off of the side of the head, lay the slice cut side down and cut into 4ths, then, cutting across, slice 1/8 inch thick. Do not use the core of the cabbage - you'll recognize it when you see it. When bacon is brown and onion tender add everything but the apple. Stir well. Cover, reduce heat to low after about 5 minutes and simmer for 30 minutes. Peel and chop the apple and add to the cabbage. Simmer another 15 - 20 minutes or until cabbage is very tender. It can be kept, covered, over low heat until needed, up to an hour longer.